I promised you more sad monsters, so here’s a favorite among my friends. It surprises me that more vampires don’t have facial hair (I actually can’t think of a single vampire who sports a beard). I imagine that this level of surprise equates with your level of bewilderment concerning the amount of time I spend time thinking about the facial hair of fictional creatures. 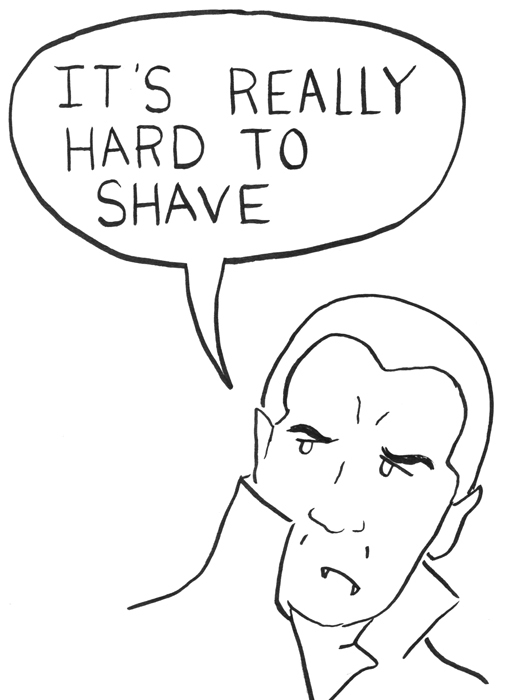 I guess all I’m saying is I hope some network decides to develop a show about a vampire barbershop so I can be finally let on the secret of how these beings have managed to remain so secretly smooth shaven for so many hundreds of years. This entry was posted in Uncategorized and tagged barbershop, beards, dracula, sadsadsad, shaving, vampire. Bookmark the permalink. All the blood stains in your beard would give you away. Unless you’re a readhead.